His main activities are comics, painting and music. After a lot of works for different publishers and magazines, it is in March 2000 that he releases some of his more personal works in his Journal 1999 (a dairy in comics' format). He self-published eight other books and many short stories since. 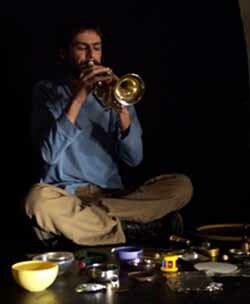 Wright, Mike Bullok, Vic Rawlings, Nate Wooley...Kerbaj is going to release soon a solo CD and a quartet with Sharif and Christine Sehnaoui and Ingar Zach, on the newly born Lebanese label Al-Maslakh (the slaughterhouse).